Congratulations to Jara Bulant (CZ) for winning the Men's Open and to Kristina Kraszewski (WA) for winning the Women's Open. 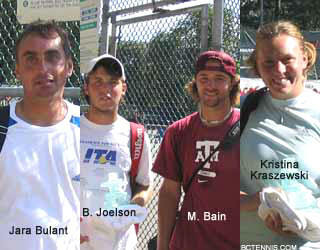 The pair also won the Mixed Doubles event. Bulant teamed up with Josef Brabenec (BC) to challenge Matt Bain (TX) and Brett Joelson (OR) in the Men's Doubles, but lost in a close match 7-6 and 6-3. Thanks to everyone involved in the event for making it such a success.